MEJ provides video remote interpreting services in American Sign Language (ASL) and Spanish. We have combined our talented pool of trained linguist and video conferencing technology to develop Interp-Via-Video. Video interpreting allows for you and your Limited English Proficient or Deaf and Hard of Hearing client to make a secure video conference call to a remotely located video remote interpreter. We provide video remote intepretering for hospitals,business meetings, education,interviews,social service appointment, medical clinics and legal offices. Our video remote interpreting service can be connected to using ISDN protocol or IP Internet protocol and viaour Videophone service. Interp-Via-Video is cost effective, secure, easy to use, compliant and available 24 hours a day and 365 days a year. MEJ Video Interpreting service provider that offers a pleasurable video interpreting experience with excellent audio and video quality. Using Interp-via-video eliminated the need for expensive equiptment and will deliver interpreting service to your desktop , IOS or Android Device..
To insure the highest level of quality interpreting services are rendered MEJ only employs R.I.D certified and highly qualified, trained, and experienced on-site interpreters familiar with interpreting protocols and ethical practices. Interp-Via-Video interpreters are familiar with medical, business, legal terminology and the cultural nuances of the target and source languages. What does Interp-Via-Video (video remote interpreting) do? Greatly reduce your organizations cost for providing interpreting services for Deaf, Hard of Hearing and Spanish clients by eliminating the travel expenses associated with on-site interpreting sessions. Provide on-demand access to trained qualified Sign Language and Spanish interpreters for Deaf and Spanish clients. Reduce the waiting time for qualified interpreters to respond to medical emergencies and unscheduled visits by L.E.P and Deaf and Hard of Hearing clients/patients. Reduce your organization’s liability for non-compliance with regulations such as the American Disabilities Act and Title VI of the Office for Civil Rights. Increase your organization's ability to provide equal access to the services it offers to Deaf and LEP clients.. Provide additional support for your in-house staff interpreters or local interpreting service provider . What Equipment do I need to utilize (Interp-Via-Video) video remote interpreting ? High-speed broadband Internet access such as cable, T1, DSL, SDSL or ISDN connection at (384 kbps up stream) or a T1. Interp- Via-Videocart a mobile video conferencing solution developed by MEJ that is available in both wireless and wired versions. The wireless version of our Interp-Via-Video cart, mobile video conference solution, is ideal for use in Medical and Business environments that require on-demand use of qualified interpreters. High-speed broadband Internet access such as cable, T1, DSL, SDSL or ISDN. 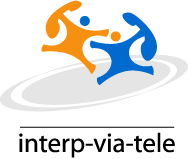 We recommend callers using video remote interpreting for sign language interpreting services connect to our facility using an connection at (384 kbps up stream) or a T1. The following equipment may be also be used to connect to our service center .A Desktop Computer or Labtop meeting the following specification. A webcam - microphone (often included with web camera), speakers or headset. Set top television video conferencing equipment - purchased from following vendors Polycom, Sony, Tandburg, and Emblazed . Call for assistance with seting up your video conferencing systems. Setting up an account is fast and easy. You may use any of the following methods to set up an account by fax, on-line interface or telephone. To set up an account via telephone call 1-(212)-426-6017 .
if you wish to connect to Interp-via-video please open an account ,we assistance with opening an account via video conferencing call. Interpreters are available to assist Deaf and Hard of Hearing that would like to open an account using video phones. To set up an account via fax. Download the new client registration form from the following link (registration form). Then fax the completed registration form to the following number 646-395-9579. A MEJ representative will call you back, to verify we received your faxed registration form, access your organizations needs and confirm your registration status. Setting up an account using our online interface. How much does Interp-Via-Video cost? MEJ offers the following on-demand video remote interpreting package to healthcare providers. Pay per use price structure. No minimum charge only pay for the time you use. When should Interp-Via-Video not be used? Appointments with patients/clients uncomfortable with the use of new technology. Medical appointments with small children. When the participants feel that it is not effective to continue. Where should I use (Interp-via-video) video remote interpreting? MEJ provides the technical support, training and equipment that will enable your organization to deploy and utilize HIPPA compliant (Interp- via- video) video remote interpreting service effectively and quickly. Now Open an Account and get your organization on the road to compliance by calling 1-(866)-557-5336 .